Camshaft alignment tool 1 – BMW No.11 3 240. Camshaft alignment tool 2 – BMW No.11 3 244. Crankshaft pulley/hub puller (one-piece pulley) – BMW No.11 8 190/200/210. Crankshaft pulley/hub puller (two-piece pulley) – BMW No.11 2 150/410. 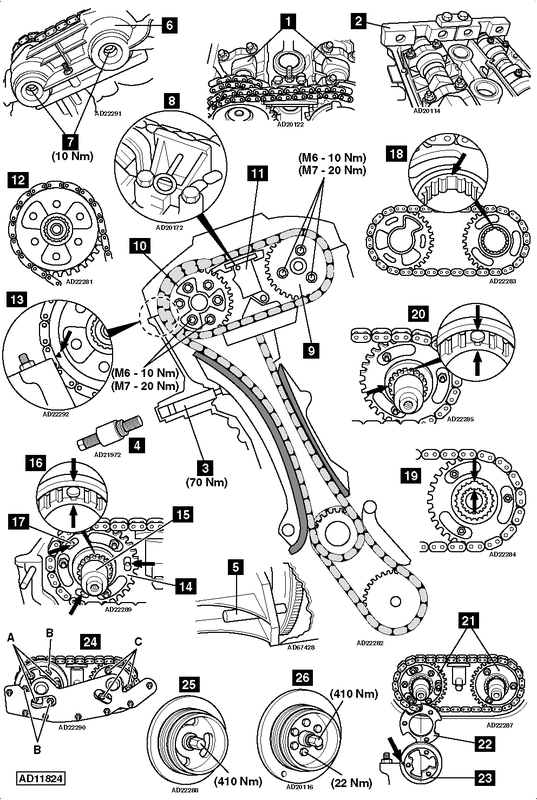 Timing chain pre-tensioning tool 1 – BMW No.11 4 220. Timing chain pre-tensioning tool 2 – BMW No.00 9 250. NOTE: Screws behind sealing caps have LH threads  . Remove exhaust camshaft sprocket and chain  . NOTE: Camshafts can be turned without valves contacting pistons when crankshaft is set at 30° BTDC on No.1 cylinder. NOTE: Remove gasket before fitting special tool  . Tool No.11 6 150.